This was how the headlines on Mashable, and several other news websites, today looked. A stark contrast to the headlines throughout Wednesday evening into Thursday morning. 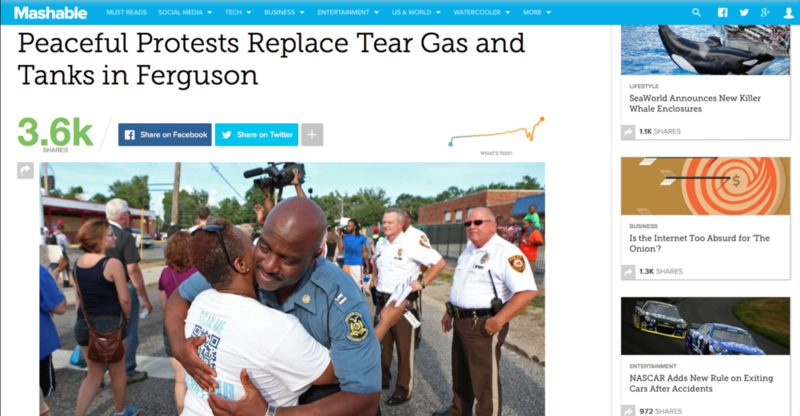 Missouri Governor Jay Dixon stepped in and relieved the St. Louis County Police Department of their duty to maintain the peace in Ferguson amidst gatherings, protests, and demonstrations by local residents. Dixon replaced the PD with the Highway Patrol. This a good step forward in Ferguson. Kudos to Highway Patrol Captain Ronald Johnson and his team for their work thus far. Praying they can keep growing the trust back between residents and law enforcement. Still praying for you, Ferguson. Here's a story from the Washington Post.